LSC has holdings of printed and manuscript collections supporting research in the history of printing, the graphic arts, bibliography, the book trade, fictitious imprints (1600-1900), and emblem books from the sixteenth through the nineteenth centuries. The Ahmanson-Murphy Aldine Collection, the largest and most complete collection of Aldine press imprints in North America, was started in 1961 during the tenure of Chancellor Franklin D. Murphy, who, with the ongoing support of the Ahmanson Foundation, encouraged its growth and expansion over the course of many years. 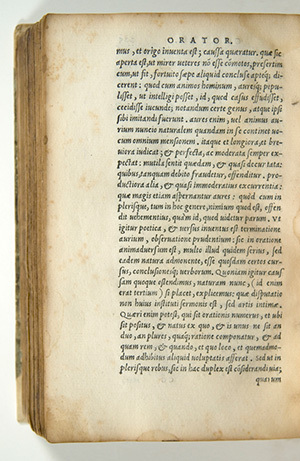 The collection, numbering approximately 1500 titles, includes the imprints of the press of the Venetian scholar-printer Aldo Manuzio (1449 or 1450-1515), his son Paolo Manuzio (1512-1574), his grandson Aldo Manuzio the Younger (1547-1597), as well as those of associates and imitators. Among the many treasures of the collection are Aldus’s monumental Greek editions of classical texts, printed in several Greek typefaces he designed: his first imprint, Lascaris’s Erotemata of 1495; the works of Aristotle in 1495--the first printing of a major Greek text in its original language; Theocritus in 1495, Aristophanes in 1498, Herodotus in 1502, Homer in 1504, and Plato in 1513, to name just a few. Other highlights include several important works in the octavo format, a small, light and portable book format introduced by Aldus which allowed readers to carry their books with them, and made good literature accessible to the masses: the 1501 Virgil, the first portable book Aldus printed, as well as the first to be printed in his new italic type, based on humanistic manuscripts of the age; Petrarch’s Le cose volgari, from the same year, the first book printed in italic type in a vernacular language, and the first edition of Petrarch in the new small format; and a 1502 edition of Sophocles, the first of the Greek classical texts to be issued in the small format. The collection is also notable for the many variants that it contains, as well as for the distinguished provenance and important signed bindings of many of its copies. Owners of some of the volumes include King Louis XVIII, the French statesman Pierre Séguier, the art critic John Ruskin, the library of the Duke of Devonshire at Chatsworth, Charles Spencer, Earl of Sunderland, and English bibliomaniac Sir Thomas Phillipps. Many of the great binders are represented, such as Rivière, Derome, Bozérian le jeune, Bedford, Roger Payne, Trautz-Bauzonnet, Leighton, and Binder of the Blickling Lucian. The printed catalog of the Aldine collection, The Aldine Press: catalogue of the Ahmanson-Murphy Collection of books by or relating to the Press in the library of the University of California, Los Angeles… (Berkeley: University of California Press, 2001), provides detailed descriptions and collations of acquisitions through 1999. Readers should also search the online catalog. Records for items in the Aldine collection include the code ALD which can be used in keyword searches for more precise retrieval. Aldine imprints have call numbers beginning with Z233.A4, and a list of these titles can be retrieved with a call number search of this prefix. A call number search of Z233.A41 will retrieve a list of Aldine counterfeit editions. Additional information is available in the Aldine bibliography by A.A. Renouard, Annales de l’imprimerie des Alde (New Castle, Del. : Oak Knoll Books, 1991).